March's Chamber Luncheon, held at the Executive Royal Inn, was once again almost a complete sell out, and no wonder really. 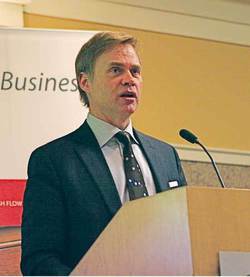 Each year for the last few years this is the month that Mr. Todd Hirsch, Senior Economist at ATB, comes to give his often eerily accurate projections of what the coming year will look like financially for both the world and the region. This year he has also been recognized by Venture Magazine as one of the 50 most influential people for 2013. Todd began his talk by speaking about what he is seeing happening in the global market this year. He stated "Recovery looks to be hesitant and uneven in 2013, but the good news is that it is a recovery. However, there will be some speed bumps along the way." He commented on how some of the worry in Europe seemed to have eased up until the election in Italy took place last week. He said that "This has definitely stirred the pot. Italy is sending worrisome messages to the rest of Europe as to who will hold the balance of power there, and how they are viewing their debt situation." He then commented on how in China it is now the Year of the Snake, and this year could indeed bring good fortune for them. He predicted that the astronomical growth of 12-13% that they had experienced over the last two years should even out to a more realistic 7-8%, which should still keep them as the leaders in growth for this coming year. Speaking of the United States, Todd said that he thinks he sees the general public experiencing a bit of anger with their political situation but the better news for them is their economy itself. The US housing market is posting reasonable results and the long term trends are picking up speed. He said that 2013 should be a better year for the States, and that they could outperform Canada with their GDP for the first time in several years. He then moved on to our country and commented on how Canada had received a lot of accolades for economic performance over the last several years but right now the Canadian economy was "cooling off". He commented on the 1.8% GDP growth we have at the moment, and how our biggest problem is our export market. "Our major international buyers are not able to afford to purchase as much of our product right now." said Todd. He spoke of how in January, the Bank of Canada introduced a new phrase by saying that there is "less imminent need" to raise interest rates any time soon. Which intimates that the Canadian economy is not in another recession but is definitely under-performing. Moving on to Alberta, Todd called us the "engine of Canada's economy." He said that the third largest contributor to Alberta's economy tends to get overlooked here because the number one industry, energy, is so huge. The industry he was speaking about is forestry. He stated "Forestry is so very important but it has had a really hard go the last bunch of years. So many mills and lumber businesses have shut down, but what is left is very lean and efficient. Now that lumber prices are starting to take off we are in a very good position, and forestry is poised to be one of the economic stars in 2013". He also pointed out that grain and seed commodity prices are very strong and this trend should continue through 2013. This means that due to the favourable weather conditions that produced near record crops last year, and appear to be poised to possibly do the same this year with the good snow pack we received over the winter, things are shaping up to be a good year for farming. So Todd felt safe in saying that agriculture should be another leading sector for Alberta this year. He also predicts that our housing and construction market is probably going to be just an average year. He commented that this year builders are being more constrained with their new house starts so there should not be a lot of declining prices. He sees the housing market as remaining pretty stable for the year with possibly a slight rise happening but nothing big. After that statement Todd drew a laugh from the crowd by beginning the next portion of his presentation with; "Okay, enough good news!" He then continued on to say that while he is not predicting a recession or any real hardships for Alberta, he is talking about "possibilities", particularly within the energy sector. Commenting on the fact that there has always been a price differential between Texas oil and Canadian oil of about $15.00-$20.00/barrel, he said that just prior to Christmas that differential ballooned to $30.00-$40.00/barrel, and currently it sits at about $27.00-$28.00/barrel. "Why is that?" He asked. He answered himself by stating that the current differential was due to the North Dakota shale oil coming onto the market. "By using these deposits, within the last three years the US is back to producing about what they did in 1990, so with a stable supply of their own product, as Canada's main oil purchaser, it has put a constraint on their need to purchase oil from us and has pushed our oil prices down." He was very open in stating his opinion that Canada really could "flip a coin" to try and figure out what could happen this year in our energy sector. He commented that "Everything has changed this year because Obama doesn't need to campaign for votes anymore, so he is looking at different areas where he can make a splash with the people." He said that in his opinion, US environmentalists have made the Keystone XL Pipeline a "whipping boy" for the entire industry. Todd also spoke on several pipeline options that Canada is currently exploring, including less well known options that would see our oil being piped to eastern refineries to be refined right here in Canada and sold internationally as a higher priced finished product. "We need to look at our many options in the future and find some way to figure out how to get our land locked oil into the larger world market." He stated. Todd concluded his presentation by saying that "There has been 'x's' in Alberta's past, most notably in 1981-84 where we felt paralyzed. I do not believe that 2013 will be like that. I think that 2-3% growth will occur and things will moderate. Keep in mind though, that this is just a moderation, not a recession, but things are going to feel a little cooler."